A couple of weeks ago I had the pleasure of sitting down with Brett from Food Carts Portland (yes, in Oregon) and enjoying, what else but, some great cart food and even better conversation. We got in touch with Brett when he tweeted that he was looking for a good cart to try in Madison – we provided a recommendation, and asked if he’d like company! Isn’t social media just plain wonderful? He also agreed to do a guest post for us, so I’ll only give you his couple-sentence story before I get to the emmmmpanadas we ate. Brett was in Madison for a city planning conference, as I understand it. Portland is set up similar to Madison (from what I can tell) in terms of city planning goals, ideas, and what not; so he had a great deal to contribute to conversation regarding how to build “effective” working cities. 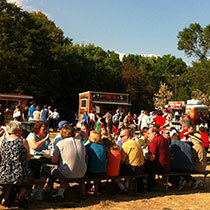 Portland, however, has OVER 600 food carts. Woah. He told me that the city will use closed-down parking lots and have only food carts set up there, which creates a sense of “community” when everyone gathers to meet there – so you can imagine the great perspective he had to bring to the conference. I’ll let him talk more about that though! Though I was maybe more hungry for “blog talk” than lunch, I ended up picking one of the better food carts for smaller entree options. 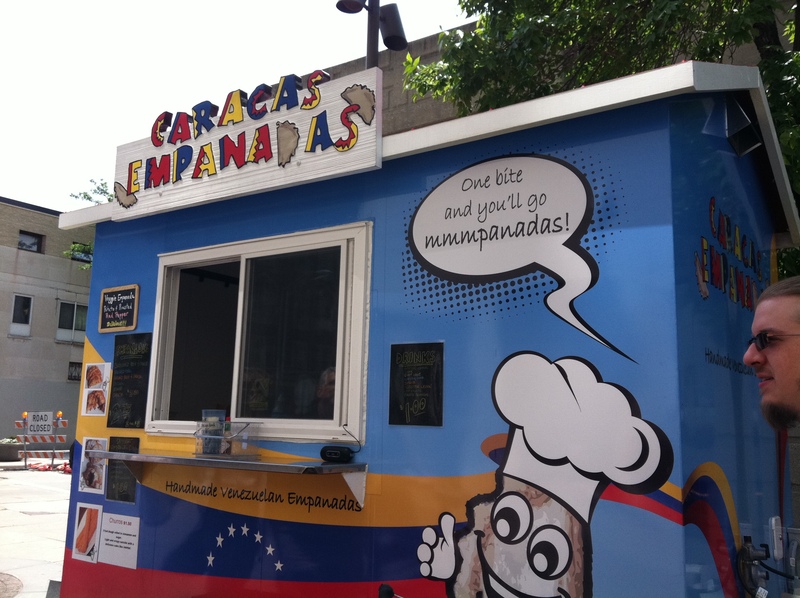 I’d heard great things about the empanadas here, so I was anxious to try one! They had one for $2.75 or 2 for $5 – I placed my order for one Veggie Empanada (made with potatoes and roasted red peppers). There was a bit of a wait to not only order, but also to get your food – which was probably a combination of him preparing them in the back and the line of about five people waiting for theirs. I didn’t mind this time around, though – I had Brett to chat with! Once we received our brown bagged lunch, we found a shady spot and dug in. There was a green sauce included, and though I’m not totally sure what it was, I was glad to have it. Don’t get me wrong, the empanada was extremely tasty (I definitely said “mmmpanada”!) – the ingredients didn’t spill all over, the bread was delicious, and it was nice and warm! But, as should be expected I suppose, the empanada was extremely greasy – and I found the sauce helped cut that for whatever reason. I was also a bit surprised to see that the filling more looked like a mush than veggies. 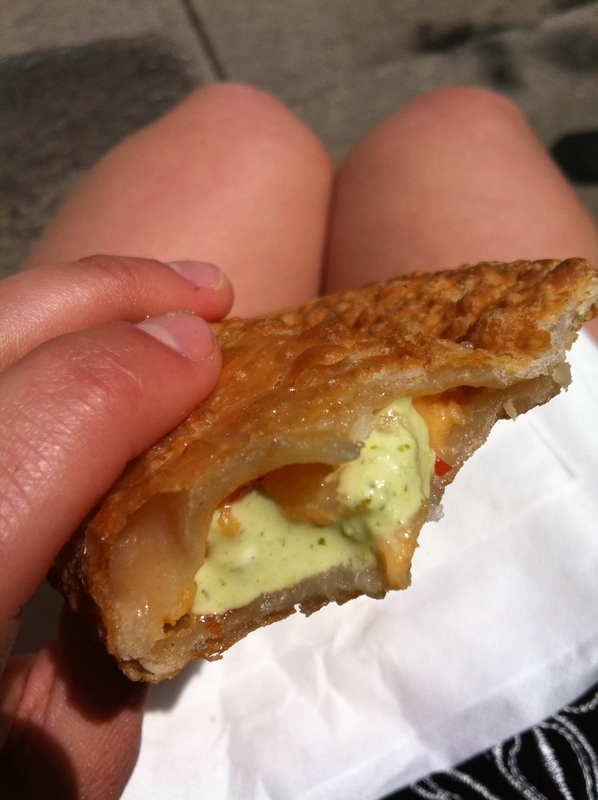 Veggie Empanada with "green sauce"
For those with smaller appetites, one empanada was perfect – I certainly walked away full. But as a person who also does not normally eat a lot of greasy food, I also walked away with a bit of a stomachache for the rest of the day. I blame this on not being used to the amount of grease in the food – but definitely may deter me from heading back to Caracas Empanadas.